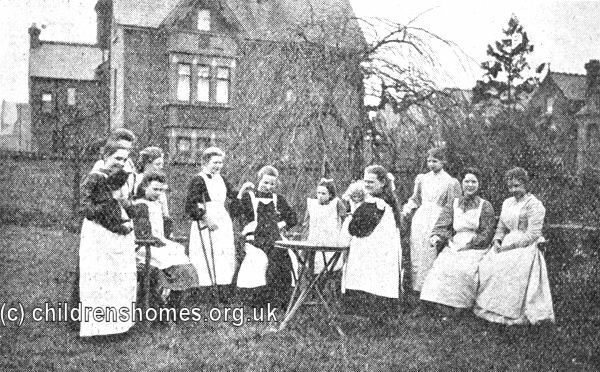 In 1897, the Waifs and Strays Society took over the St Agnes' Home for Girls on St James' Road, Croydon. It housed twenty 'crippled' girls aged from 14 to 16, perhaps transferred from other of the Society's homes when they reached the appropriate age. The girls were taught handicrafts such as needlework, knitting, and basket-making. The items they produced could be sold to contribute towards the running of the home. 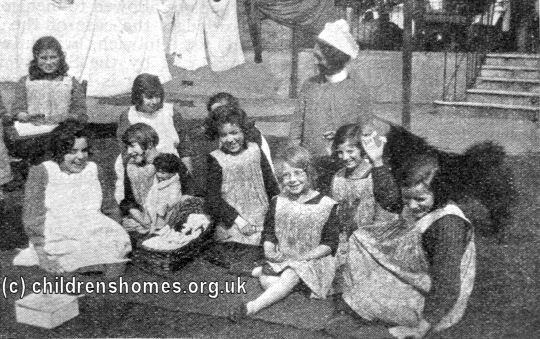 In October 1900, the home moved to larger premises in a former church institute at 7 Wellesley Road, Croydon, where 30 girls could be housed. The location of the home is shown on the 1913 map below. St Agnes' Home for Girls site, Croydon, c.1913. 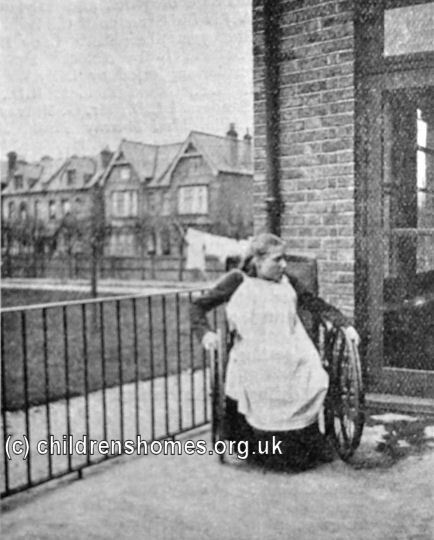 From 1913, the home was used as a hostel for severe physical disabilities who were unable to lead independent lives. 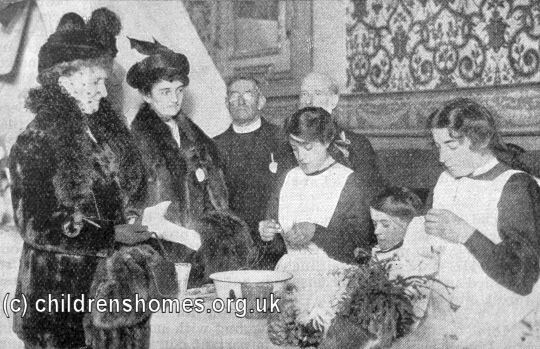 On March 12th, 1914, The Queen paid an informal visit to the home. Her Majesty, who wore mauve dress and hat, arrived by car at 3.15p.m. and stayed for about hour. The royal party visited the chapel, work-rooms, dormitories, and kitchen, and the verandah set apart for tuberculous children. The Queen showed keen interest in the girls' fine sewing and basket-work, and selected some examples of the latter to take away with her. 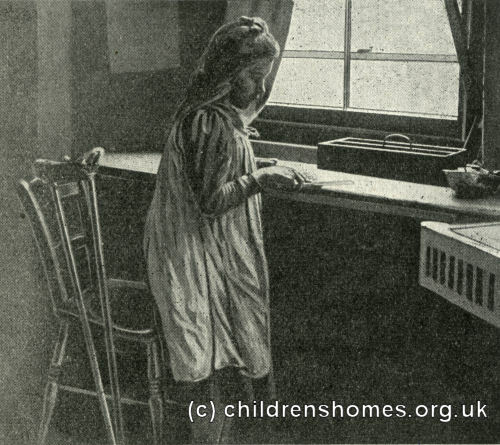 She spoke to a resident name Ada Grossett, aged 12, who, though having only one arm, was a skilful needlewoman. In 1923, a new chapel was opened by the Bishop of Croydon. Two years later, a new altar was installed. The home was closed in 1935, with some of the girls being transferred to the new St Agnes' Home at Pevensey Bay. The Croydon home's chapel was dismantled and taken to the Society's recently established Margaret Calliard Memorial Home at Wingfield in Wiltshire. The Wellesley Road building no longer exists.